I just got home from a nice stay at my mom's and it's put me in a reminiscing mood. Despite being a voracious reader of science fiction (among other genres), I never picked up a copy of one of the "big three" science fiction magazines - Asimov's, Fantasy & Science Fiction, Analog - until I was in my early 20s. And when I did finally start picking up the occasional copy of Asimov's or Analog, I often felt like they fell a bit short of my expectations. Part of the problem, I suspect, was that much of my short story reading had been in anthologies, which highlights an author's or magazine's best stories. But it's also almost certainly because the magazine with science fiction I did read regularly was OMNI. It was the first grown-up magazine I had a subscription to and it was awesome. 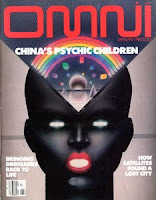 The magazine had science articles - in retrospect often pretty "fringy" or pseudoscience-based, yet always interesting - and original short science fiction stories, all in a glossy colorful package. Just look at the short stories OMNI published - during my subscription that spanned from 1980ish to 1987ish the list included William Gibson, Pat Cadigan, Robert Silverberg, Harlan Ellison, Greg Bear and many others edited by the Ellen Datlow. These were the short stories of my teenage years and they came in a shiny sciency wrapper. OMNI eventually ceased publication in the late 1990s, but it lives on at the OMNI Online tribute site (from which I borrowed the cover images) and some pages of the web-only version of the magazine that were archived by the Internet Archive. To my 20-year-old self Analog and Asimov's seemed dull in comparison. And honestly, they still seem a bit dull me as a 40-something. It's not just the lack of pretty pictures, but the magazines' stiff "attitude" (for want of a better word) and old-fashioned feel. 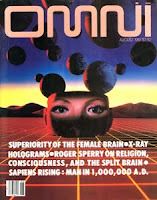 To my mind the spirit of OMNI is closer to current personal science blogs than any print magazine. And sure, the "big three" still publish good short fiction. But there is strong competition from other mags like Strange Horizons, Clarkesworld Magazine, and Subterranean Magazine, to name a few. It's not a surprise to me that the circulation numbers for the big three has been declining. I don't know what science & SF-loving teenagers are reading these days, but I hope whatever it is provides as much entertainment to them as OMNI did to me. Hypnotizing covers! I have in my collection a few of them and always feel proud of it .. I endorse your views regarding the stuff of OMNI ....sometimes a bit of sensationalism but overall a fantastic magazine. I agree -- OMNI was quite something in its heyday, despite its sad devolution into solid woo (but then that's also the case with Scientific American: once required reading for those interested in the sciences, now a terminally dumbed-down tabloid). As for Analog and Asimov's, they're stuck in a bizarre time warp, both emotionally and intellectually. It's been literally decades since using the name Analog for a SF magazine has been anything but a sad, sad joke. I mean, that's like wearing spats or something. I dug Omni, despite a kinda glitzy quality it had. There was a lot of great fiction published there -- in a lot of ways, it was the cradle of cyberpunk. Of course Analog was itself a key player in the day. I mean no criticism of the magazine itself but the name? Come on. They would actually present a more current image if they reverted to Astounding. Awww thanks. I miss OMNI too, if you must know :-) It was a joy to work on. I too have happy memories of the varied and awesome and unique stories that Omni provided for me in the 1980's. Athena: In my teen years I was a bit of an aficionado for In Search Of ...-style reports on the paranormal and unexplained phenomena. OMNI's content fit into that niche nicely. Sean: Analog's name is indeed amusingly anachronistic. I always felt like I should enjoy reading Analog - I like hard SF and I am interested in science - but it just never did much for me. Datlow: I miss SciFiction too. Why do the good ones always go? Mom: I vaguely remember reading choice bits from OMNI at the dinner table. I hope it wasn't as annoying as it appears to me in retrospect. I remember holing up in the campus library reading back issues of OMNI. Nothing like the glossy 'cover art' for each story (and the separate art galleries were so great). Ellen Datlow had her finger on the pulse! Anyone remember SCIENCE FICTION AGE? I bought every issue.